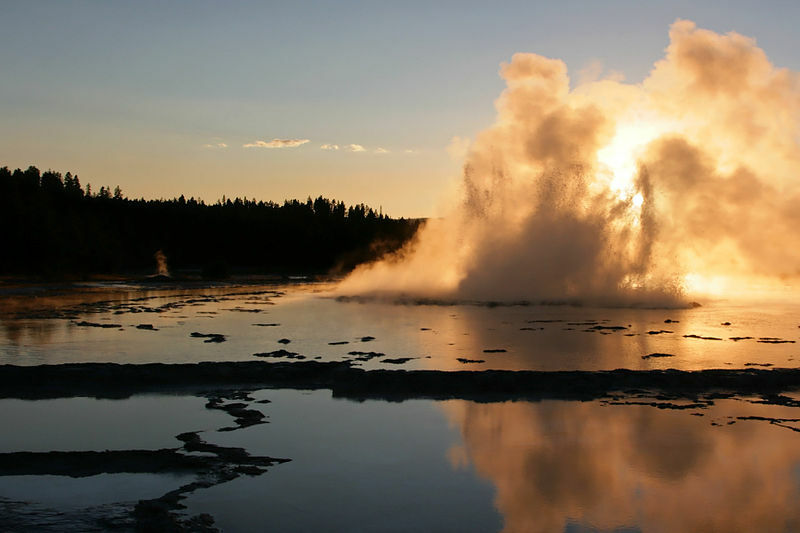 Five geysers to keep you coming back to Yellowstone long after Old Faithful becomes old news. Great Fountain Geyser at sunset. Photo courtesy of wikipedia. MY LOVE OF YELLOWSTONE’S lesser-known geysers started with little Echinus Geyser in Norris Geyser Basin, with its moderate, predictable eruptions, and whirlpool drain after the gushing had stopped. When Echinus erupted, at least in the first several years after I “discovered” it, I had the show all to myself and whomever happened to be walking by. I felt as if I’d stumbled onto something special. Something open to everyone, but also something secret. Over the years, the crowds grew larger, and seating was built onto extended boardwalk. Then, in 1998, the eruptions became erratic and unpredictable. I haven’t seen an eruption in several years, but that doesn’t stop me from sitting on the empty benches, and waiting a little longer to see if I’ll get lucky. Here are five other geysers that keep Yellowstone’s thermal features interesting, no matter how many times I visit. If you’re new to Yellowstone’s backcountry, then the short hike to Lone Star Geyser will be a great introduction. The trail follows old auto road that’s been closed since 1972, wandering along the Firehole River, and through meadows where wildflowers dot the tall grasses with color. The trail is about 2.5 miles each way, getting you far from the thunder of Harleys and the buzz of tourists, but the grade makes this a leisurely stroll more than a hike. Lone Star’s eruptions are about three hours apart, so expect to spend a little time relaxing in the area, enjoying the solitude. Even minor eruptions gush water up to 45 feet, so don’t be fooled. Major eruptions are followed by a roaring steam phase. Two things make this geyser different than most. First, its beautiful location. Balanced on the edge of the Firehole River, Riverside Geyser launches water in a 60-degree arc over the river. If the eruption occurs during late afternoon, the low sun makes rainbows out of the mist. Even without the ideal sun conditions, Riverside is one of the most attractive geysers in the park. The other thing that makes this geyser different is its predictability. This is one of the most predictable geysers in the park, rarely exhibiting the constant flux that most thermal features go through. This is because, even though it lies near other geysers in the Old Faithful area, it’s far enough away that it has its own source of heat and water. This distance from the rest of the hot springs also means that it’s just far enough from the pitter-pat of tourist feet that you may even get an eruption all to yourself. Maybe. Eruptions are every 6-7 hours and last about 20 minutes with a height of about eighty feet. Look for it across the Firehole River along the paved trail from Old Faithful just before you get to Morning Glory Pool. One of Yellowstone’s biggest predictable geysers, Great Fountain Geyser’s eruptions last for an hour, and can shoot water between 75-150 feet (with occasional bursts of 200 feet). The geyser lies along the Firehole Lake Drive, a meandering one-way road that passes several of the Lower Geyser Basin’s thermal features. Compared to the other geysers of the area, which erupt from cones, Great Fountain erupts from a crater within an intricately terraced hot spring. This may be an indicator that the geyser is fairly new. While its eruptions can usually be predicted to within an hour or so, the other geysers of Firehole Lake drive, like White Dome Geyser, which erupts with greater frequency, will help pass the time. What Imperial Geyser lacks in power, it more than makes up for in beauty. This backcountry geyser churns and spurts at the edge of a brilliant blue and orange pool. The otherworldly colors are a result of mats of algae and bacteria known as thermophiles for their ability to thrive in the scalding water. The three-mile hike gives Imperial a feeling of seclusion, as well as showing the resilience of a forest recovering from the fires of 1988. Dense groves of new trees, and rampant wildflowers illustrate how essential fire is to this landscape. Along the hike you will encounter Fairy Falls, a feathery 200-foot cascade, and tiny Spray Geyser. Imperial Geyser erupts infrequently, but when it does, the geyser can reach 35 feet or more. Find the trailhead at the metal bridge near Biscuit Basin. Considered one of the most attractive geysers in Yellowstone, the irregular Morning Geyser can have massive 200-foot tall eruptions dwarfing the other features in the Fountain Paint Pots basin. Unlike geysers such as Old Faithful and Lone Star which release a jet of water, Morning geyser erupts in a series of ground-shaking bursts that illustrate just how powerful geo-thermal forces are. Of course, seeing this geyser erupt will be based more on luck than research, but that shouldn’t deter you from stopping by for a look. It’s the hike through the woods, or watching a breeze ruffle wildflowers while you wait that makes these geysers special. And when you see one of them go off, you will have your own secret spot that ninety-percent of Park visitors will never see. Eric Warren has an unhealthy love of all types of transportation, and is addicted to long stretches of open road. May I link to this from my own post about Yellowstone? It’s a great sampling of non-Old Faithful geysers to get the most out of the park!